Bo Ralph was born in Gothenburg in 1945. He took a bachelor’s degree at the University of Gothenburg in 1969. In 1972 he published the book Introduktion i historisk språkvetenskap (”Introduction to historical linguistics”). Apart from giving an historical expose on the variegated theories and methods within the history of linguistics it took an active part in the theory formation surrounding generative linguistics. Three years later he took a Ph. D. with a dissertation titled Phonological differentiation : Studies in Nordic Language History – taking its starting point in a series of structure descriptions of fundamental changes within the Nordic languages. After his Ph. D. Bo Ralph remained at the University of Gothenburg and was appointed associate Professor at the Institution for Swedish language in 1977. Among other things he played a central role in a groundbreaking lexical database project that in 1986 resulted in the first edition of Svensk ordbok (SO) – a thesaurus for the Swedish language. He was appointed Professor at the Institution for Nordic languages at Stockholm university in 1982, where he remained for two years. During this time he was part of editorial board for the text critical national edition of August Strindbergs collected works. He also published the book Fornsvenska för nusvenskar (1983; ”Old Swedish for new swedes”). In 1984 Bo Ralph returned to Gothenburg, now as a Professor at the Institution for Nordic Languages. The same year he became a member of The Royal Society of Arts and Sciences in Gothenburg. He has also worked for the Swedish Institute and the Bibel Commission. Alongside this, and his own research, we find popular science books about local Gothenburg dialect. What has really kept him occupied for several years back is however a future standard work on the history of the Swedish language. This is at the request of the Swedish Academy and can be seen as corresponding to Svenska Akademiens grammatik, (”The Swedish Academy’s grammar”) which was first published in 1999. 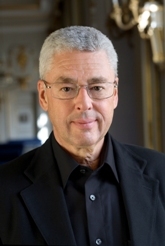 In the year 1999 Bo Ralph was elected to chair number 2 in the Swedish Academy, as successor to the the philosoph and sociologist Torgny Segerstedt.